by Niall Douglas. Last updated 2008-03-30 00:00:00 +0000 UTC . This page has been accessed 13 times since the 26th March 2019. Sunday 30th March 2008: 4.04pm. Phew, it's end of term at long, long last! Well, it was two days ago, but I have been catching up on my sleep as with the MSc in High Performance Computing interview on Friday, I didn't get much of it this past week. They accepted me BTW, but without help for the fees of £5,600 - which basically means I can't go as such a high fee would cripple me. So it's increasingly looking like it'll have to be Ireland for at least the coming year - it could be much worse I suppose. Let's hope that Megan can both get in and afford to go given what the dollar has been doing recently. 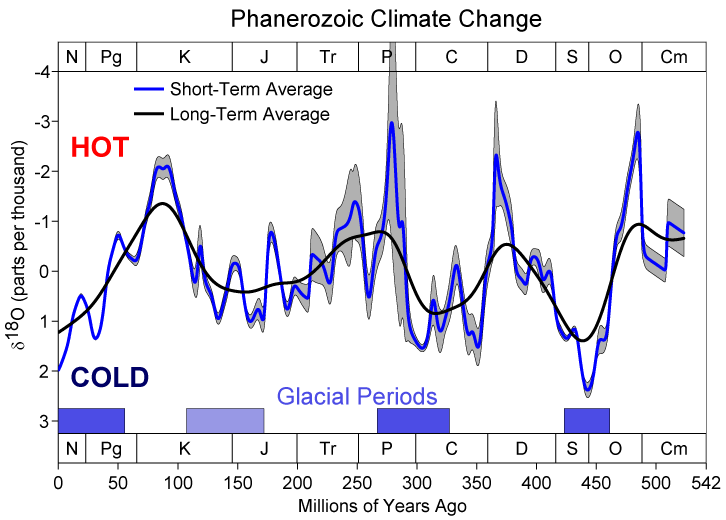 Quaternary Glaciation Cretaceous–Tertiary Extinction Triassic-Jurassic Extinction Permian–Triassic Extinction Karoo Ice Age Late Devonian Extinction Ordovician-Silurian Extinction Andean-Saharan Ice Age Cambrian-Ordovician Extinction Glaciated Earth? 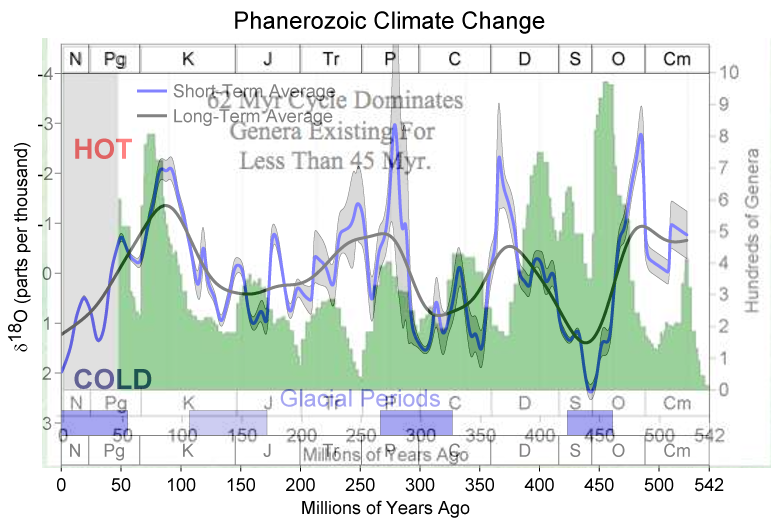 This is much better - there is a clear link between CO2 levels and temperature. As the temperature falls, more plants consume more CO2 than is being produced by rock weathering and such and thus its level drops - this is opposite to our intuition of heat being good as we associate plants growing profusely in summer when it's hot. As you can see, between the punctuated rises in temperature, the drop in CO2 is more gradual than the drop in temperature indicating improving evolution of plant photosynthesis capability - mostly by improved location and shaping of the environment, but also somewhat due to genetic improvement. Methane also tracks temperature because methane is produced by decaying organic matter, and when it's cold those little bacteria work extremely slowly - hence why your fridge keeps food fresh for longer. The most interesting part is how it suddenly shifts to high temperatures and high CO2 and then takes some time to become colder and less CO2 relatively gradually - and I'll posit a cause later. 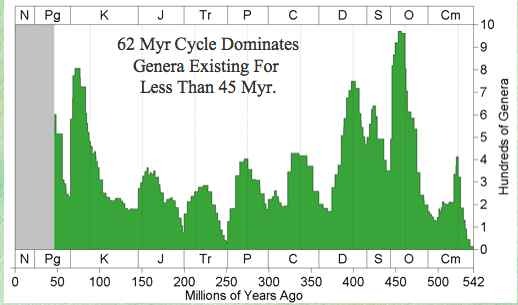 Note also how rising sunlight levels do increase CO2 but always leave it lower next cycle. Finally, note how temperatures on this planet normally are 4C lower than at present! Of course one might now say "well how do you know it isn't the CO2 and the methane which raises the temperature and not the other way round?". After all, both are potent greenhouse gases and man-made emissions of both are currently being strongly blamed for climate change? I think that this, more than any other point, is what confused people about me linking cooler temperatures with health. And you'd be absolutely right - more greenhouse gases mean hotter planet, less greenhouse gases mean cooler planet. From that perspective, lots of gases and heat are good for plants so they grow lots and lower the gases, making it colder. This is the traditional viewpoint - but consider things from a biodiversity view:- more and more plants are required to keep those gases low, therefore there are a LOT more plants (and thus animals) around in total at the coldest point - if there weren't, greenhouse gas levels wouldn't become so low. There is so much going on in the graph that it's hard to describe, but one can see that the 96% extinction at 250m came at a time when Gaia was pretty unhealthy anyway - probably the reason it was the worst mass extinction that we know of, and also it took the longest to recover from. Sometimes biodiversity precedes temperature change, other times it's the opposite. I agree that from this evidence my opinion is still not proven - but equally, the more common association of "warm = good" is no more proven. A very good piece of news is that Gaia was at her healthiest point in 500m years before we started amplifying the minor mass extinction after the end of the last ice age 15,000 years ago. Thermodynamically speaking, the point to take from all this is when things are at their most ordered, most cohesive, most healthy is when there is the greatest difference between energy source and final energy sink. For the biosphere, the temperature of the sun is pretty fixed at 6000K so it's at its healthiest when it is extracting the maximum possible amount of entropy from sunlight - which implies the coldest possible ambient temperature. See my diary entries during my summer of research for a lot more on this. The red solid line (left axis) is the average house price divided by the average annual income per person in the UK - as you can see, it tended to stay around twenty times for much of British history and it still tends to return to that multiple. The green is the interest rate the bank sets and the purple is the rate of inflation. The blue dotted line is real interest rates, which is what the banks charge minus inflation. Traditionally, a sudden jump in this house price multiple indicated that large inflation was about to come within a year - what economists call "overheating" in an economy. As you can see, from about 1983 onwards, house price multiples have started to ignore the interest AND inflation rates quite noticeably - despite what monetary economics or the government thinks about it being a form of economic stabilisation control. 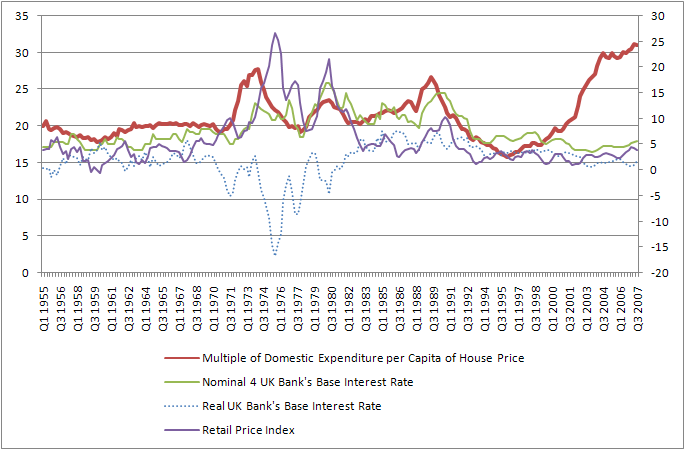 Nevertheless, we must ask: why should this house price multiple move so independently of the underlying interest rate? Here's what I think: a lot of talking heads on TV and newspapers are blathering about cheap credit being the cause of the recent financial crunch (because hedge funds, banks, big investors et al routinely borrow short-term money to cover their temporary massive losses on the derivatives market). This is simply untrue - in fact, the real interest rate sat around zero for much of recent British history and since the early 1980's it has returned to a few percent which is still about half its average during the boom times of the British empire. No I think it's far more a case of too much capital floating around - after the great boom of the 1990's, we simply have too much excess capital for the stockmarkets to absorb and as a result it has tried to find elsewhere to go eg; emerging markets or real estate. Too much of something does imply that it becomes cheaper - but I don't think that means cheaper in cost per se (after all, it can't go below the real interest rate in cost), but rather cheaper due to more of it being around and thus less work is needed to get it. China certainly has far more easy capital than it knows what to do with - in fact, it like other developing countries has actively turned capital away. 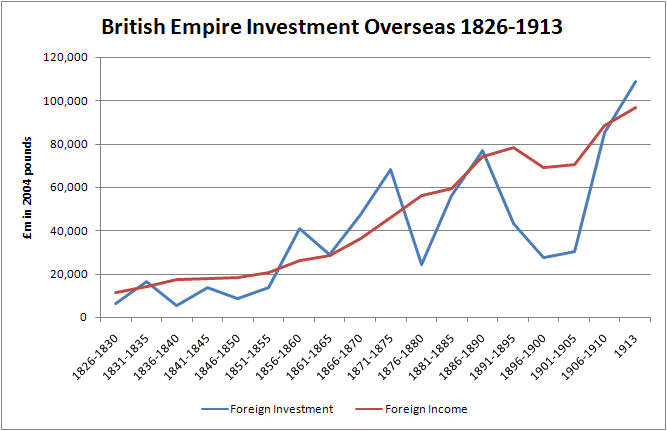 As one can see, the empire saw a handsome average return of around 50% for its risky investments overseas. Furthermore, as the British economy wobbled (as you can see from the wildly oscillating outflows), the foreign income was a welcome source of stability during the recessions of 1839-1842, 1866-1870, 1877-1879, and the long recession 1890-1906. Now money is a sort of energy - or rather, the movement of money is kinda like energy moving in that it has an effect on its surroundings and tends to lose some of its value during transit. For example, if you move money from A to B you pay a charge - you might not think you do of course because it's hidden via the clearing system, so when you transfer money or pay in a cheque it goes into clearing ie; takes a few days before it arrives. This is one of the greatest scams of modern finance because money moves in milliseconds, so all the banks really do is take your money and leave it in their own bank account for three or four days before sending it on. While there it earns interest you see which the bank takes as commission - meanwhile of course, you lose that interest. This is why GDP growth, ie; the growth of the money value of how many final goods and services were produced, has some relation to actual economic growth. It's basically a measure of how much money has changed hands and is a very good indicator of how much effect our economy has had in total on everything. Unfortunately, it has much of its effect on our mental state rather than anything physical - after all, many wars have been fought over perceived wealth advantages which may or may not turn out to be warranted. Financial markets are supposed to discover those goods & services which people will want next or want cheaper and funnel capital into those for an expected return beyond the bank interest rate corresponding to the amount of risk. As covered in recent entries, when markets believe the information they receive about upcoming goods & services, greed sets in, all is well and the money flows (ie; a boom). When it becomes apparent that that information is not to be trusted ie; because firms and analysts have started lying about the worth of these proposed investments, fear sets in and financing dries up (ie; a recession). Thus one can see that what drives the boom & bust cycle is trust in information:- when trust is high, interconnection & interaction is high and when trust is low, everyone hoards and boards up the windows. What causes the loss of trust which causes a recession? It's the boom itself. Why? Because as the economy booms, there is a mad scrabble to get your money in there and the most sound investments will get oversubscribed first, leaving only the less sound ones for the excess (often borrowed) money to enter. There is an ever increasing incentive for investees to lie about the soundness of their proposed investment and likewise for the investor who wants to find superior returns for their capital, but being afraid of "losing out" they throw more & more caution to the wind. When reality sets in, trust gets lost - but note something really interesting: what causes a recession is too much capital available too easily. 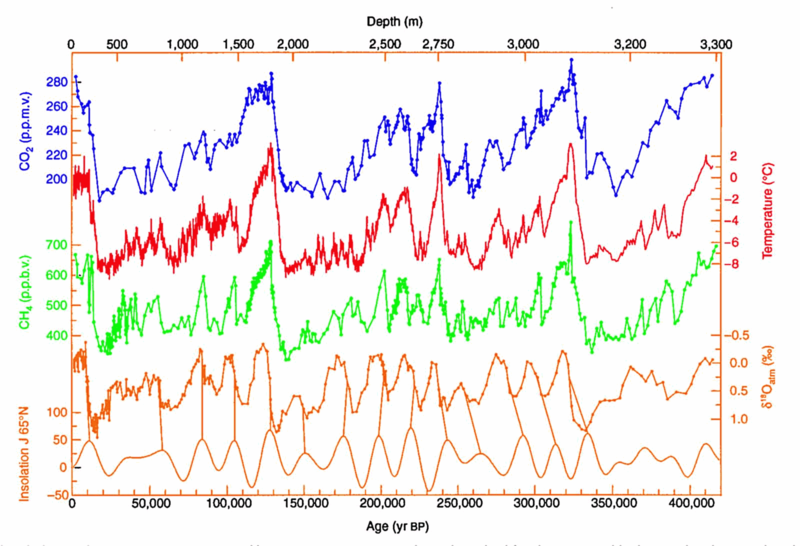 This exactly mirrors how ice ages break down. At their coldest, total planetary biomass is at its peak - there is more abundant food available than at any other time as the biosphere wrings every last bit of entropy out of sunlight. In fact, there is too much food available too easily. You're probably thinking I'm mad here, but thermodynamically speaking, the more entropy you dissipate in a smaller space and time period, the exponentially higher the effects on the environment it causes. One effectively gets a compression of space and time from the entropy's viewpoint - which is also correct as in Physics we tend to hold light as the constant and relativise everything else around that. Time, in the sense of the rate of change caused to the environment, speeds up. The problem is that all those numerous plants & animals being so diverse, interlocking & complicated that they cannot adapt to such increasing rates of change, caused by their own success, without losing structural cohesion (ie; a rising fever), and thus one gets a collapse. We do know however that total diversity exponentially rises over time, so after each iteration things are always better on average than before by some compounded percentage. This is exactly the same process that drives the rise and falls of civilisations. It also is the same process that drives people going mad and recovering as I did. This notion of structural inflexibility - that the success of a system's structure generates so much change in its environment that it fails to adapt to changing conditions, so it collapses which forces adaptation - that is THE central thesis of my book, that we must deliberately & consciously deconstruct our society to make it vastly more flexible - that means eliminating most of our laws, social & legal structures, and in the process keeping what is absolutely required for our civilisation to continue - and not one iota more. Hence the main points of my book: improve speed & breadth of transmission & quality of information in all areas so trust is not only kept higher, but over-simplifying complex issues avoided. Simplify laws to most essential guidelines instead of tombs of books no human could possibly know in their entirety. Move economy's focus from increasing physical output to increasing cognitive improvement. Remove as many incentives to lie or falsify as possible. Tax what people do NOT what they earn - this unifies social, moral & legal societal controls in one, coherent direction rather than the current mess where taxes punish good behaviour (eg; earning more money) and bad behaviour is untaxed (eg; crime). Well I hope you all enjoyed my four part series on economics and biology - as you might be able to tell, a lot of this is being synthesised for my book though I'll be a lot more rigorous (and hopefully clearer) there. Ok, time for food and cleaning the house before Megan and Johanna get back. Be happy everyone!